Enjoy the bird calls and tranquilness of Bay View Rd - a quiet cul-de-sac of which you can access a wonderful family friendly beach - Cox's Bay in just a 3 minute walk. At mid - low tide, walk along to the Wharf to enjoy their fish and chips or brilliant food at The Wharf Kitchen and Bar. A 25 minute walk leads you to the town where there are cafes, restaurants and wonderful unique shops to browse in. Raglan has has a lot to offer - with fishing, kayaking, walking and of course surfing it's world famous left handers just 12 minutes away by car. Our house has been newly renovated and with our huge family table, kid friendly layout - with baby gates in place and well equipped kitchen, you will have have no problem settling in here! We have a small grassed garden out the back, with swings and a large family table for you to enjoy amongst the native bush. Down around the side of our house, your kids (and adults!) can enjoy jumping on our new 14ft 'Jumpflex' Tampoline. There is also plenty of off road parking for you vehicles. Pets are allowed upon approval. Please contact us to discuss and no pets in the bedrooms at anytime. Please note: with larger bookings we may ask for a bond. This will be fully refunded within 48hrs of your departure. I am a mum of three young ones, and am currently a stay at home mum, along with being a graphic designer. I am originally from the UK and have now been living in this magical town for 8 years. This property is well looked after and much loved as it is out family residence throughout the year. It is so close to a magical swimming spot on a high tide. This has been amazing for our young ones to enjoy on hot days, but even on a low tide they enjoy looking for crabs and collecting shells near the stream. Our house is very private - being surrounded by beautiful native trees and is very light and airy with fitted fly screens in place to keep away the summer mosquitos and cicadas! A 25 minute walk into Raglan town and on a low tide a 10 minute walk to Raglan Wharf. Children's books are stored on the book shelves of the third bedroom. Children's toys are stored in the wicker baskets of the third bedroom. A small flat lawn with children swings is situated at the back of the house. You are so welcome Andrew and family. You were awesome guests who left our house perfectly. All the best for 2019 and we welcome you back anytime! Lovely house. Great location set amongst the trees. Walk to beach at bottom of the road and along to the Wharf. Only a short drive into town. Fantastic property, very peaceful and family-friendly. Fantastic property, very peaceful and family-friendly. The back of the section is getting some new grass in, and we were therefore unable to use it, but the very large common area (dining+lounge) is massive so it wasn't an issue. The beds are comfortable, there is plenty of light, and there are mosquito nets in all the windows. Only a short walk from a beach, and Raglan is small enough that you can walk to town. Lovely quiet place, would stay again! 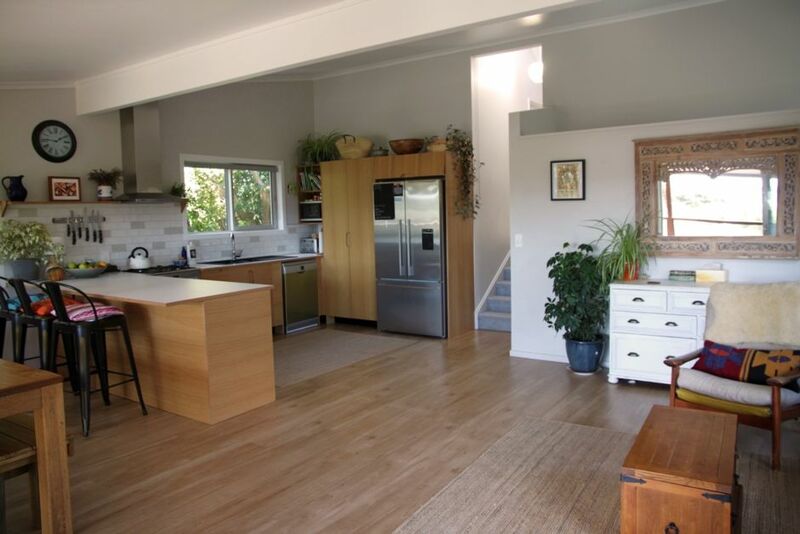 Great property, and nicely renovated with modern appliances and double gazed joinery.